The strange convergence of roads at the junction of Charlemont, South Richmond, Harrington and Camden streets with the east-west thoroughfare of Harcourt Road is a recent addition to the city. 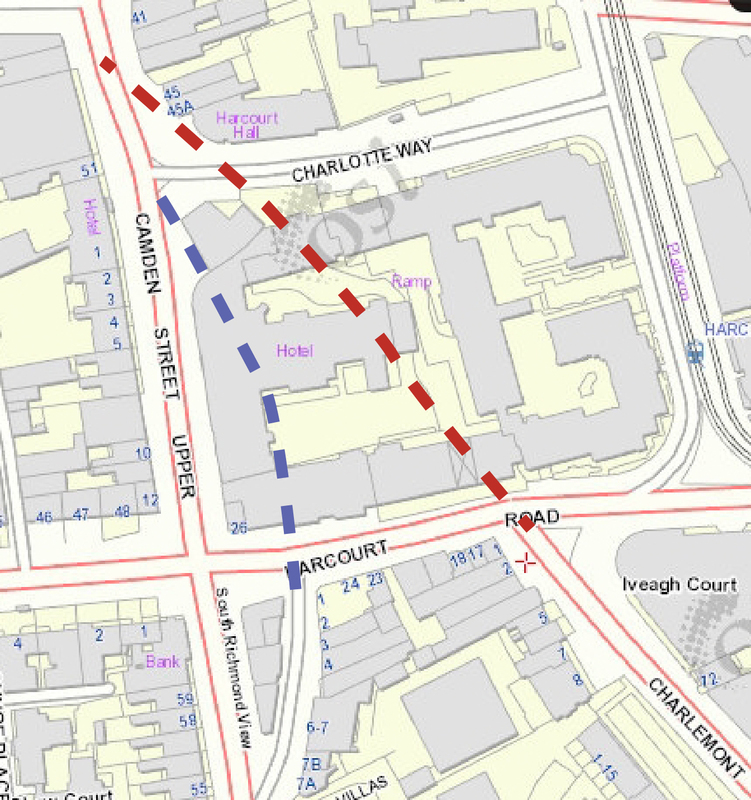 Especially odd is the abrupt termination of Charlemont—one of the main routes in to the city and the arc-like segment of road that runs alongside South Richmond street, which was formerly a half of Old Camden Street and is now seemingly nameless. It wasn’t always so. 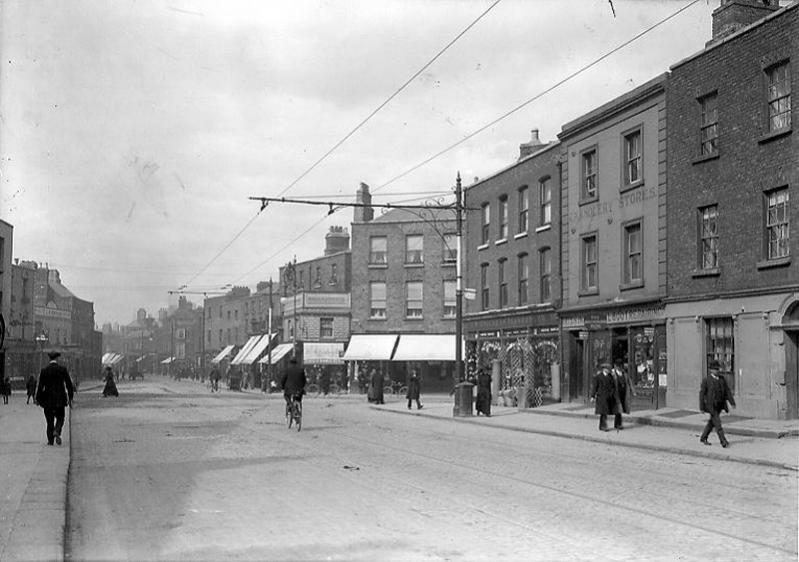 Describing the approach routes possible for the Battle of Rathmines in 1649, the road south from Camden Street along Charlemont Street was the marked as the “road to Milltown” (Brunskill, 1939). This road followed what became known in 1780 as Charlotte Street, which connected directly Camden and Charlemont Streets and can be seen clearly on maps drawn since (Behan, 1994). The street’s name was in honour of Queen Charlotte (1744 – 1818), wife of George III (the “mad” one), and mother of his fifteen children. 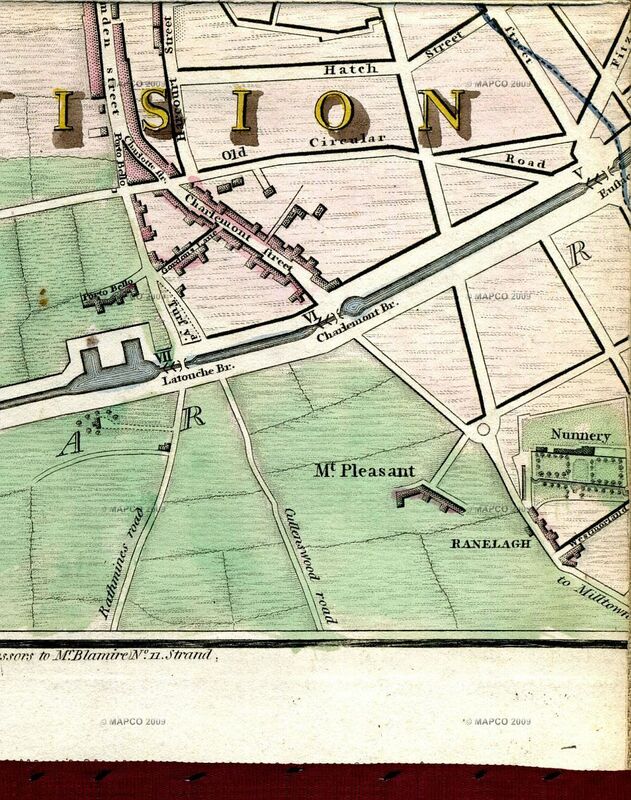 At this time, the area was on the edge of the city, but as can be seen from the 1798 map, there was significant development along the route. I was first aware of the non-existence of Charlotte Street on the National Library’s Flickr Stream, who posted the photo “Demolition” by Elinor Wiltshire, which shows the street in 1964. The shop visible in the photograph is of the Kavanagh Sisters Hair Stylists. The Kavanagh family are also present in 1911 Census, with James, a hair-dresser, who looks like he was father of the sisters of 1964, named Ellen and Martha. They would have been 56 and 54 at the time this photo was taken. Next door in 1911 was Willie Kavanagh, who in 1901 was a “Hair-Dresser Improver”. Just as we risk sinking into the mundane, out pops a really interesting nugget: Charlotte Street was home to the offices of Jacob Neville, land surveyor, who operated there between 1773-1782 and succeeded by Arthur Richard Neville in 1789 (Gibney, 1958). Now for non-Wicklow people, this mightn’t seem too fascinating, but Neville was the first man to do a full survey of Wicklow, publishing his famous map in 1760. His nephew Arthur published an updated version of the map sometime after 1798. Jacob’s contemporaries included Bernard Scalé, who we met at Ely Place and Thomas Mathews who we met at Golden Lane. Despite the association with Neville, Charlotte Street never amounted to much more than housing small businesses. By the mid-twentieth century, as is evident from the National Library’s Wiltshire photograph, the street had run into terminal decline. A photo taken from a similar perspective in the 1970s from the Dublin City Library Collection shows that not much had improved, and by the 1980s, plans were afoot to develop an office complex. The road was closed by ministerial order on 28th July, 1992, and Charlotte Street officially no longer existed (Behan, 1994). A nod to the history of the place was the naming of a new road around the office complex “Charlotte Way”. The demolition attracted media attention as it involved demolishing Stein’s Opticians, as recounted in this “Come Here to Me” blog post (and update). Despite officially not existing, a sign for Charlotte Street still exists. Approaching from Charlemont St, there is a small recess in the building, where someone with sympathies to the road that once was has placed a sign up marking the old route. And a plaque? Well the closest we can get to a plaque on a street that doesn’t exist is just in time for the centenary of the Lockout. At the point where Charlotte Street met Camden Street, a plaque marks the building that was between 1912 and 1916 the headquarters of the International Tailors, Pressers and Machinists Union, established by Jewish Workers (having previously housed a synagogue). A. P. Behan, 1994, Up Harcourt Street from the Green, Dublin Historical Record, 47(1), 24 – 45.